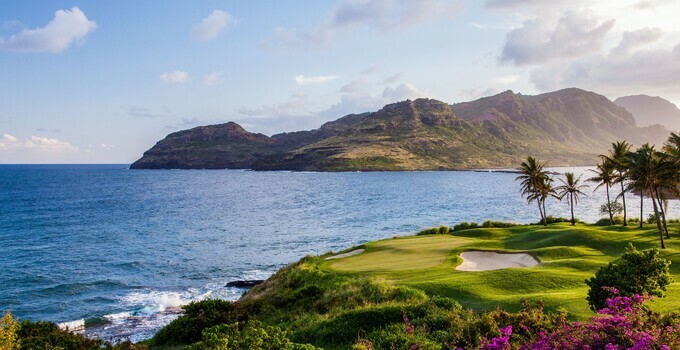 Billy Casper Golf (BCG) has been selected to manage Kauai Lagoons Golf Club, home to the longest continuous stretch of oceanfront golf in Hawaii and the island’s only Jack Nicklaus Signature Golf course. At Kauai Lagoons, BCG will direct course maintenance, staffing and training, clubhouse activities, merchandising, golf instruction, marketing and public relations, special events and financial management. Existing employees have been retained by BCG, and the operation will greatly benefit from their immense knowledge of the property and relationships within the community. Just minutes from the Lihue airport and situated within an upscale resort, the 27 holes at Kauai Lagoons were named among the “Top 50 Golf Resorts” by Golf World, “The Top 125 Golf Resorts in the U.S.” by Conde Nast Traveler and “The World’s Most Beautiful Golf Courses” by MSN Travel. A “must play” on traveling golfers’ Hawaii itineraries, Kauai Lagoons is especially famous for its 219-yard, par 3 fifth hole on the Kiele Mauka course that Nicklaus calls “one of the best holes anywhere.” A challenging tee shot over a mango and guava tree forest leads to a green closely encircled by bunkers and dense, tropical foliage. Kiele Mauka – At 3,655 yards and par 37, golfers use their drivers on three par 5s in the first six holes as they meander through lush jungles with dramatic, mountainous views. In addition to Nicklaus’ rave of the fifth hole, the par 3 eighth features a small green tightly guarded by water on the right and menacing bunker to the left. Kiele Moana – At 3,501 yards and par 35, it was extensively renovated by Nicklaus in 2011 and boasts more than a half-mile of unobstructed ocean views. The signature, 331-yard, par-4 seventh hole is set along the Pacific Ocean with a sloping fairway, rugged cliffs and one of Hawaii’s only peninsula greens. The 459-yard, par 4 finishing hole presents howling trade winds, considerable water and jungle hazards, earning a reputation as Hawaii’s hardest hole. Waikahe – At 3,423 yards and par 36, it is entertaining for golfers of all skill levels. Wide fairways, minimal forced carries and well-guarded greens provide bite and benevolence for juniors, families, groups and low handicappers alike. Kauai Lagoons’ spacious driving range, putting green and chipping green with bunker are popular among locals and traveling golfers. Situated overlooking the Nawiliwili Harbour, the clubhouse includes a golf shop with brand-name merchandise for both the golfer and shopper.